In recent days, shareholders of Sports Direct have finally approved the retailer’s bonus scheme, after years of turning down the firm’s plans to reward founder and deputy chairman Mike Ashley. This award that could potentially see Ashley and up to 3,000 employees share £200m in equity, as long as profits double by 2019. Ashley himself possesses a reputation as a tough businessman and has had a colourful relationship with the City. However, Sports Direct’s share price has risen 30 per cent in the last 12 months, outshining and outlasting competitors. 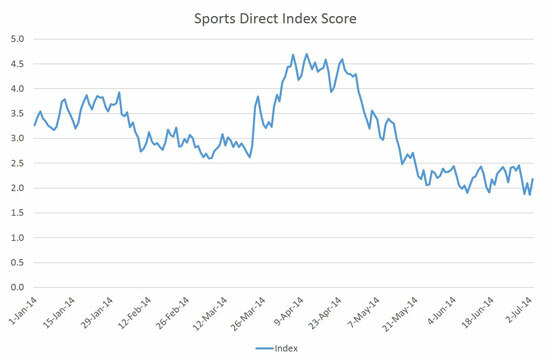 As YouGov’s BrandIndex tool reveals, Sports Direct divides opinion, with consumers holding complex views about the brand. And yet, the same shoppers push the firm’s sales and profits higher every year. How does Ashley do it? Since the start of 2014 the company’s average Buzz score, a measure of whether people have heard anything positive or negative about a brand in the last two weeks, has been -0.6, and at one stage bottomed out at -3.6. This suggests that much of what the public hear about Sports Direct is negative – such the coverage over the company’s use of zero-hour contracts. The brand’s reputation has even worse scores, coming in at an average of -10.8 since the beginning of January. The measure has fallen markedly in the last few months, from -7.0 in mid-March to -14.5 at the beginning of June. This coincides with some of the negative publicity around the company’s tussle with investors over its share awards. Yet the most telling measure is steady and positive – the public’s purchase intent for the brand. Since the turn of the year, the average score is a +3.7, and even hit +5.1 last week. 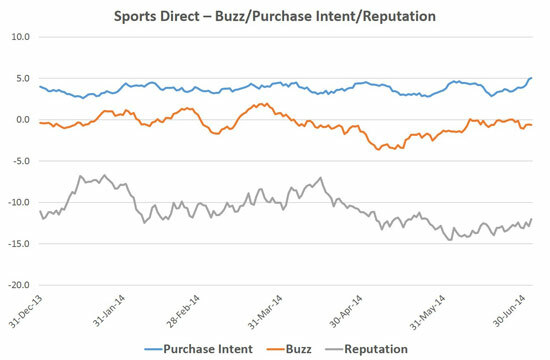 It seems that despite the negative publicity, the public still want to shop at Sports Direct. Given affordability is still a major issue for many people, the brand places a premium on price and its Purchase Intent score and profits show that consumers like what it does. In order to reach its lofty sales targets imposed by shareholders, will Sports Direct need to change its message to attract those who look for quality as the economic upturn continues or will it continue its current strategy that has worked so well to date? The brand’s incredible success to date suggests that whichever route it takes will be a successful one.